How to get paid on time | Do your customers keep paying you late? Every business owner at some point struggles getting paid by a customer, and sometimes a late payment can cause serious implications for a business. Following the steps through this guide will help to ensure your customers pay you on time and decrease your chances of “non-payment”. One of the main reasons companies don’t get paid is because they don’t always obtain the full details for their customer’s when signing them up. When you sign-up a new customer you need to know their company name and address, (registered office and trading address). Find out if the company is a Limited company or Sole Trader, a VAT number, a contact name for accounts and who is the Director of the company. If you don’t have a “new customer sign-up form” to fill out for your new customer’s, we have included a free template to download below. This process starts with your sales people, so make sure they are discussing your terms of business and payment terms with your new customer before signing them up. Discuss your payment terms with your customer when signing them up, (i.e. you expect payment within 7 days, 14 days, 30 days etc). Tell your customer how you accept payments too, whether by bank transfer, cash or card etc. Put your payment terms on your terms of business and invoices when you send them too. Don’t be afraid to let your customer know how you operate, what your terms are and what you will, and will not do. Doing this will make you seem more open and professional from the start and will give your customer a clear structured agreement. Ask your customers to sign your terms of business before you continue to do business. Send your invoice within the first 24 hours of the delivery of goods or services whilst it is on your customers mind. Some companies ask for payment in advance, so how and when you expect payment for works is up to you. If a customer has bad credit or a County Court Judgment (CCJ) against them, they are at a higher risk of non-payment, as opposed to a company that doesn’t have any. Running a credit check will allow you to make an informed decision of how you want your new customer to pay you. There are various companies who offer credit checking services such as Credit Safe, Equifax & Experian. Running a “one time” report is better than risking not being paid. A credit limit is the maximum amount of loan that you agree to provide your customer with. It should be set at the maximum amount that you are willing to lose should the company become insolvent. Circumstances can change very quickly, make sure that you monitor your customers regularly. There is a useful tool on the Companies’ House website which allows you to follow and monitor your customers (for free). Companies House will email you with updates when your customers details change, for example a proposal to strike off the company or their address! A credit policy doesn’t just apply to large companies, so read closely. A credit policy is a clearly written procedure which details your rules for supplying goods on credit and what your procedure is when you don’t receive payment. Design and implement your own simple credit policy for all to follow, so that everyone knows what steps to take within your business. Sometimes a good way to obtain a payment is to put your customer on stop. Putting a customer on stop also prevents them from building up too much debt with you. There is software available which evaluates order information relating to a customer, to establish whether to allow the order or not. If you feel fancy software is not needed at this stage, then you come up with another process to follow so that your customers keep within a manageable affordable credit amount. If you don’t have this process in place, and your customer keeps placing orders, before you know it, your customer could owe you a large amount of money and not have the means to pay it back right away. This will have a detrimental effect on your cash flow. 9. Who has the authority to make decisions? If a customers account is on hold/stop, determine who gives the authority to take them off stop. Include this in your credit policy and core processes for all to follow. Perhaps give members of staff the power to do this themselves? What is the process you follow for effective credit control and management? Below is an example of a basic, but very effective system that works to help you get paid on time. Follow up proactive call to confirm receipt of invoice and payment date. Payment not received – Follow up call and/or email to request payment after 1 day over due. 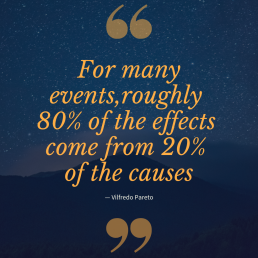 Prioritising accounts using the Pareto Analysis will enable you to collect money from customers who owe the larger amounts outstanding quicker. So by calling the top 20% of your customers to chase them for their overdue payments, you will increase your cash flow quickly by collecting the highest amount of money owed first. Run an ageing ledger report and export it into Excel. Place a data filter across the top and in the “total column” set the filter to start with the “largest sum first.” This will show you your top 20% of customers that owe you the largest amount of money. Did you know that on the gov.uk website you can “follow” a Limited company? If any changes are made with Companies’ House by a company you follow (i.e. “a proposal to strike off the company), you will be sent an email to inform you of the change. You can then write to Companies’ House if the business owes you money and object to the company strike off. This will give you opportunity to collect and recover any outstanding monies owing to your company. There are online credit monitoring systems available, however the gov.uk site is free to use and is basic. Perhaps you can include this as a process to implement when you take a new customer onboard. Once an invoice becomes overdue, how long do you wait before contacting your customer to chase them? How long do you wait before issuing a Letter Before Action? The faster you contact your customer regarding the money owed to you, the faster you are likely to combat any disputes raised, and obtain your monies owed. Document the time scales to follow when a customers’ invoice is overdue, before you involve a debt recovery agency or issue a Letter Before Action. Using a third-party debt recovery company will increase your chances of getting paid. Debt recovery is not all about sending “heavies” around to businesses and threatening them anymore. It’s done professionally and most of the time in writing and with phone calls. Finding the right debt recovery agency for your company is never an easy task. You must consider how much they will charge you to recover your debt for you. Then you will need to weigh this up against the time it may take you to do it yourself. Will it be cost effective? Is the debt collection agency working on a “no win no fee basis?” Will they support you from the initial enquiry through to legal action and/or mediation if needed? Does the debt collection agency work within your company ethos and ethics? Are they professional, open, and honest? Ensure you check reviews, their terms of business and how they operate before you sign-up. A credit management system may be needed to enable members of staff to make quick and accurate decisions on your customers, especially if you have a lot of customers. Credit management systems provide risk management, cash allocation, collection tracking, risk assessing amongst other things needed. Look up suitable credit management systems for your business. This shows that credit controllers clearly have their place in a business. Can an existing member of staff take over the credit control role given the relevant training? Do you need to hire someone with experience? Outsourced credit control is becoming more and more popular with business owners. Some businesses only require a few hours per month and some businesses require a lot more, this will depend on how many customers and invoices you have per month. 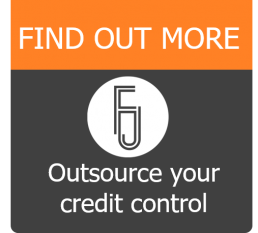 There are many benefits to outsourcing your credit control which include saving your time, (or staff members time), knowing when your customers are going to pay and you gain a credit control expert without the need for them to be in your office. Have you implemented a process to effectively manage and resolve queries from customers? Type up your own policy for handling queries and put it into place. You will be surprised how effective this is for your business. There are also online systems that will effectively manage queries for you. As part of your daily credit control tasks you need to create management reports so that you know which customers owe you money. In doing so, you can determine the appropriate actions that you need to take to collect it. DAY SALES OVERDUE (DSO) is used to measure your average invoicing collection process. It shows the average number of days that it is taking for your customers to pay invoices. It also measures the number of days it takes to collect a payment from your credit sales. Setting targets to reduce and improve your company DSO is important so that you can see how well your credit control processes are working. To ensure you are getting the best results with credit control, it is worth investing to develop employees skills further. This may improve their collection performance, how they use the Small Claims Procedure and other effective credit control solutions. Credit control requires certain skills and training and often this gets left by the wayside. Are you doing everything you can to encourage your credit controller/team to collect payments on time? Incentives for your credit control staff will certainly help with this. However, it is also important to note that incorrect incentive’s and targets can make a proactive credit controller become a debt collector! Rather than rewarding with a “monetary/cash bonus scheme”, a team day is a better alternative. This is better than giving cash bonuses, which can become part of an employees regular salary that they might become reliant on. 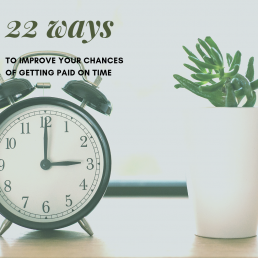 We hope our guide to “22 ways to get paid” has helped you analyse your business. Many people have successfully improved their cash flow using the guide above and reduced the chances of a customer not paying them on time. For more help, advice or support with your credit control, feel free to contact a member of our team today.